When Google released the new Gmail interface, one of the missing features was custom themes. 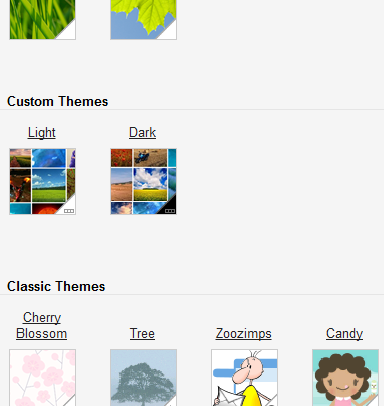 Now you can create your own themes, but they're very limited as you can only choose between a light or dark interface and pick a background image. To try the new feature, click the "settings" button, choose "themes" (or use this URL), scroll down to "custom themes", click "light" or "dark" and select an image. 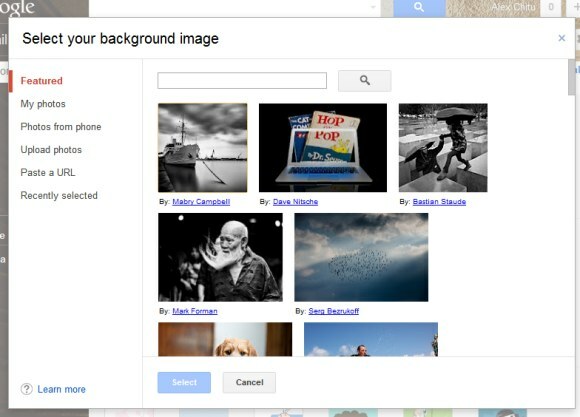 You can pick one of the great featured images from Picasa Web, choose one of your photos, use the search feature, upload an image or paste a URL. 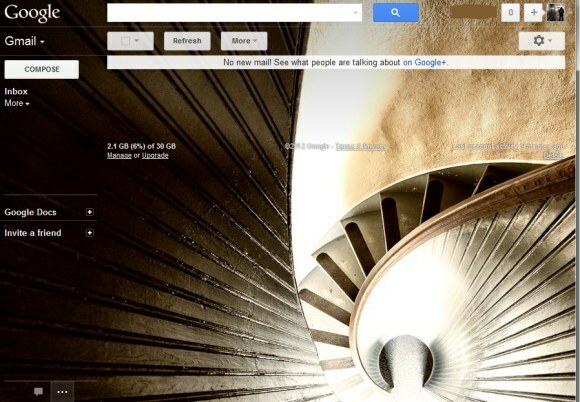 A similar interface is used for Google homepage's custom background feature. You'll probably notice that custom themes are just like Gmail's HD themes launched last year, except that you can choose your own image. "Themes are now implemented as semitransparent layers on top of a large background image. Each theme uses either a dark or light variant of most UI elements to balance legibility and visibility of the background image, allowing the background image to peek through and provide color and personality," explained Google at that time. Gmail's new themes are more adaptable and show the entire image, but you can't customize colors, fonts and all the other details of the interface. The old custom themes feature allowed you to "select colors for everything from the background of your inbox to link text". I really like this new feature, but it would be nice if you could put in a feed for a random slideshow of your pictures. This is nice, I'd like to see the same options for iGoogle. Hi. This feature is a great idea. I've been using Gmail for a while now and I didn't know that themes are available. Good thing I'd stumbled upon this site. What I'd like to see are more time of day based themes like Tea House. 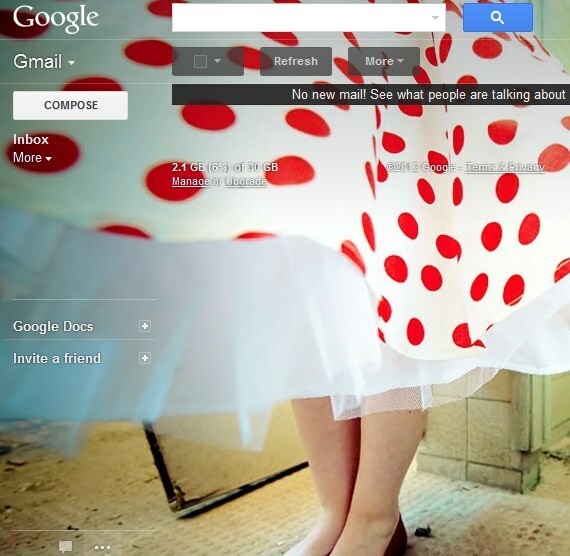 Never knew gmail had themes either..
Will have to give this a go. like the feature but i must have looked at around a million diff photos before i decided on one and in my recent activity i have the million photos i searched for...just a pet peeve i suppose, but annoying! How do I delete a photo from custom themes that I uploaded from my computer? Did you ever get a reply to this? I'm trying to delete pics from the My Photo album but can't figure out how. Please let me know, Thanks. The photos are uploaded to Picasa Web in a separate album. For example, I uploaded a photo today and it's been to a new album named "November 15, 2012". THANK YOU SO MUCH FOR LETTING ME KNOW. I GOT RID OF THEM! Shouldn't the light custom theme have dark font color. When I use a photo with a light background the font color is too light to read. I don't see any difference between the dark and light custom theme. I have the same problem. Did you ever get an answer or figure how to change the font color? I am new to gmail and I noticed this problem right away but can't seem to find a solution even though I have seen numerous references to this problem since 2011. I would appreciate it very much if you let me know if you have found a solution. How do I make my pic from home in center of screen on my gmail page?? ?